My dad turned 79 the week before last. He got sick and went into hospital on Thursday. Pneumonia. Over the weekend he was very unwell, and yesterday he expressed the view that he would like to go soon. Tonight he got his wish, and slipped peacefully away. RIP JQ. 7/8/1931 — 16/8/2010. The other one was computers. He didn’t understand them, but he could see it was important to enable me to pursue my interests, and thus he helped fund my first three: the Vic 20, the Commodore 64, and the BBC Micro. Here’s also a link to some text about him from the biography of Lillian Roxon, the legendary rock music critic. 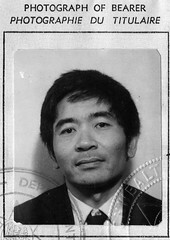 And I thought I’d repost this fantastic old passport photo of him from 1969. Sad to hear that Daniel. Condolences to you, Isaac, Jeremy and family. I’m really sorry to hear of your Dad’s passing Daniel. May he rest in peace. My condolences to you and your family. Hello Daniel, we haven’t met but I’ve been reading and enjoying your blog for some time now…Sorry to hear about your fathers passing; I wish all the best for you and your family. My deepest sympathy to you and your family on the loss of your dad. Take comfort in the fact that he had a long and happy life. Hope it was peaceful for you too mate. Take care. Just heard about this, Daniel. My most sincere of condolences to you. I am very sorry to hear that Daniel. My condolences to you and your family. I am very sorry, Daniel. My condolences to you and your dad’s family. My condolences Daniel. This will be a difficult time for you, just know that we are thinking and praying for you and your family. As someone who lost his father 24 years ago, it is not easy to go through life without your parents, but you learn and move on. I was rather unfortunate to lose both my parents by the time that I was 6, and it does define who you are. The best thing you can do to honour your father is to live a life that he’d be proud of, and never forget his legacy. Do him proud, and never forget him. May God Bless. My condolences to you and your family. Make sure you celebrate his life. Wow 79, that’s a good knock. Sorry for your loss. So sorry to hear that, thinking of you during this sad time. PS. I was going to Twitter you too, but because you don’t follow me I can’t. Sorry for your loss as well, Daniel. Once again so sorry Daniel. Warmest thoughts with you and all your family. Sorry to hear that daniel. It was my dad’s 85th yesterday. So sorry to hear of your loss. Try and take it easy for a few weeks while it’s still so new and raw. Sorry to hear. How interesting that he was a member of the Train Travellers Association and a bit anti establishment when he was young. The outrages that went on back then! I’m so sorry to hear that, Daniel. In my mind, 79 still seems too young but it’s clear that he had a great influence on you and would be very proud. Feel free to cry, vent and lose yourself to grief for a while, and don’t knock back any offers to bring over dinner, help out or have the kids off your hands to rest. Deepest condolences to you and your family. No doubt he’ll live on in the hearts of all who knew him, especially those closest to him. Thoughts and prayers are with you. Condolences Daniel, I lost my farther last year and similarly my Dad was ready to go at 82, I guess we have to take comfort that they had long productive lives and didn’t suffer toward the end like some. So sorry to hear that. Sympathies to you and the rest of your family. Deepest, deepest condolences, even though no condolences could possibly be enough. Terribly Sorry Daniel. How Did He Get Pneumonia? So sorry, Daniel. Sympathies from all of us. I’m so sorry to hear of your Dad passing, sympathy and best wishes to you all. Very sorry to hear. My deepest condolences, Daniel. I remember the last time I read a post about your dad, I think he was moving house and had too many books. Anyway, I don’t think any of this helps, but that post did make me wonder about your dad and he certainly seems to have been a good influence in your life. RIP JQ. Sad news. Great that you have fond memories of him. Hope all the arrangements go as well as could be. Condolences to you and your family Daniel. Daniel, so sorry to hear about your dad. How lovely that he didn’t suffer long and was able to pass away with tenderness and dignity. Best wishes to you and your family and all those who cared for your dad. Condolences. Sad news I hope you’re fine, I know you feel sad with what happened losing the most important and influential man in your life. I also lost my dad and it hurts because he got lost somewhere and was never found. I know that you’re dad now is in some place beautiful and nice. Let’s pray for him and never lose faith. He must be a great man having a son who writes very well. Sorry to hear about your dad. I hope that after your grief you will find many reasons to remember him with joyfulness. Sorry to hear about your loss, Daniel. I’m glad it was a quiet and peaceful end. My condolences to you and your family. I am so sorry to hear about your Dad, Daniel. You and your family have my deepest sympathies. Sorry to hear that, it started me thinking, my dad was only 46 when he died, which is how old I am now. Hope you are full of good memories. So sorry to hear about your Dad, Daniel; my condolences to you and your family. I am so sorry and wanted to offer my condolences. It seems your Dad was a substanial influence on you and you appear to have shared a great relationship with him over the years. He was a fortunate parent, and I am sure very proud of the legacy he leaves in you and your sons. Love and sympathy to you and your loved ones. Sorry to hear that Daniel, I’d like to add my condolences to the plethora. I’m saddened to hear of your dad’s death, Daniel. I remember you writing about him in the past, and thinking how much like him you are (based on that photo, at least). There’s nothing I can say that hasn’t been said, so I will simply add my condolences to you and your family. Sorry to hear about your dad, Daniel. My grandfather also died suddenly of pneumonia at about the same age. I still think about him all the time. Best wishes to you and your family during this rough time. Just catching up with the sad news Daniel – my best wishes to you and your family, as inadequate as I know that is. My thoughts too are with you at this time. It sounds like your father was an amazing man who led a full life. I’m sure you will have many wonderful memories to keep him alive in your heart. Sorry to here, Lost my father a few years back. It never gets easier just becomes more tolerable. I am so sorry to hear than Daniel. I am glad and hopeful however that your fond memories of him (and that you have shared with us) will give you strength to get through this. While it is always a shock, at least he did not suffer and wait for his time to come.